My fellow dragonfly spotting e-contact lives outside the Parc Naturel Régional de la Brenne but uses it to run the occasional dragonfly tour. So, he’s very familiar with the park and some of its more fruitful locations. He actually uses the holiday village at Bellebouche, which is where we are camped, as one of the bases for the tours. Since he’d have to pay to get in, we’d arranged to meet at 10:00 AM outside the entrance. Most of our Odo hunting has been around a couple of small étangs immediately behind the campsite. We’d wandered around part of the much larger étang de Bellebouche itself without adding anything to our tally. 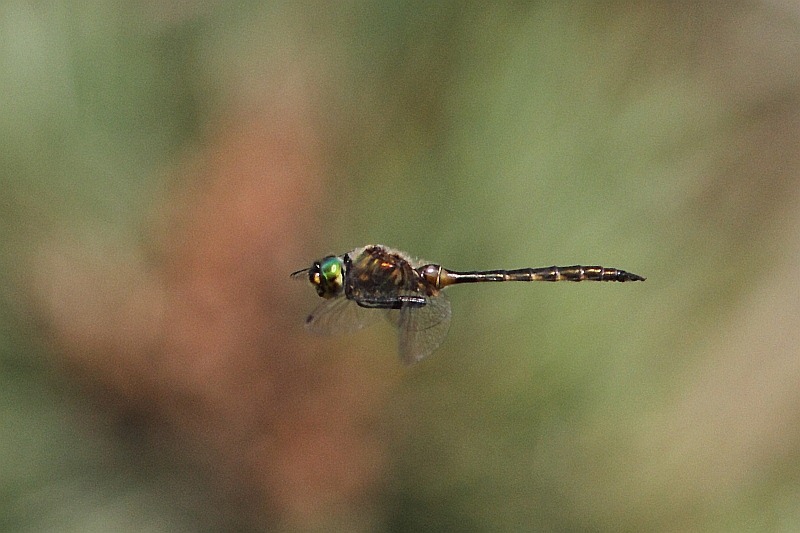 After meeting each other for the first time, we sped off to a green chemin [track] to the south of the large lake in search of a specific quarry known to be there, the highly prized Yellow-spotted Emerald (Somatochlora flavomaculata) – highly prized by me, at least. After advancing slowly spotting several of the usual suspects for a while, hawk-eyed Francine noticed a dragon “hung-up” on one of the bushes beside the track. It did not look familiar to us. Excited though she was, mercifully she raised her camera and snapped it twice before it sped off – and before I could get a shot. We were not the only ones excited, our guide seemed quite excited, too. 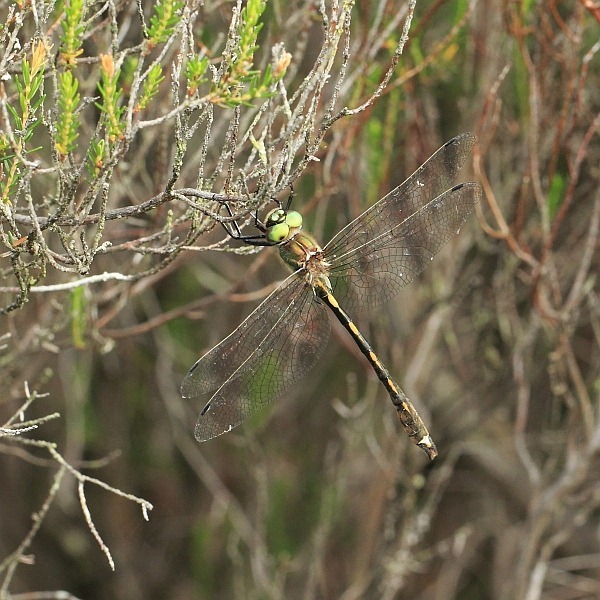 This was not our intended quarry but was another Emerald, an Orange-spotted Emerald (Oxygastra curtisii), which he did not know was in this location. Fortunately, the “orange spots” of this delightfully marked character are down the dorsal side of the abdomen and show up well in Francine’s shot. Very shortly afterwards, we came across another dragon criss-crossing the track hunting for food. Binoculars showed it to be the very thing we’d come looking for, a Yellow-spotted Emerald. Unlike the Orange-spotted, it didn’t seem keen on settling to display its markings clearly. We frustratedly snapped away whilst it was in flight but the little darlings move so fast and unpredictably that getting anything of quality proved impossible. We saw several others further along the track but the day had warmed and it was the same story, all movement and no settling. Here’s a pretty poor best, just to give an idea. Again fortunately, in this character’s case the “yellow spots” are down the side of the abdomen so an in-flight shot would be fine (if it were sharp!). We called in to the Maison du Parc as a useful lunch stop, including an excellent chocolate ice-cream. 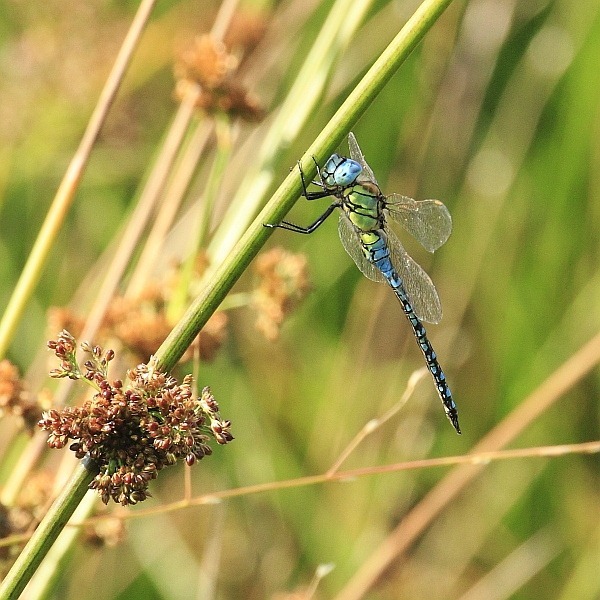 The lake here was absolutely teaming with mating pairs of Dainty Damselflies (Coenagrion scitulum). Our last port of call was to a small, newly opened reserve called Terres de Picadon. The main culprits here were Small Red Damselflies (Ceriagrion tenellum), flitting about in the company of four types of Emerald Damselfly. The excitemnet, however, came as we were almost back at the car park. 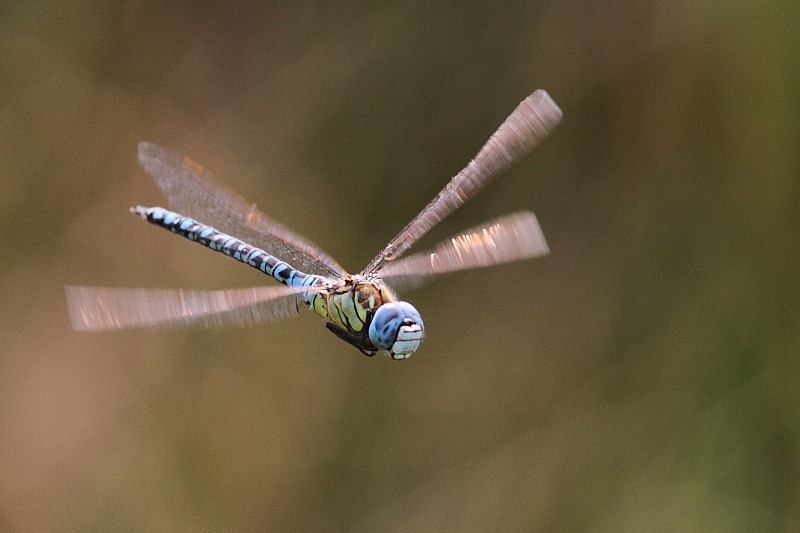 Here, over a small pond, a Southern Migrant Hawker (Aeshna affinis) was patrolling and occasionally hovering. Once again, we went into desperation mode trying to grab flight shots. Just as we’d just about had enough, it unexpectedly hung-up on a bush. Francine was best placed to get the static side shot. It was great to finally meet a fellow enthusiast who had previously been known only by an email address. Spotting three new species in one day was a bonus. Thanks a bunch!